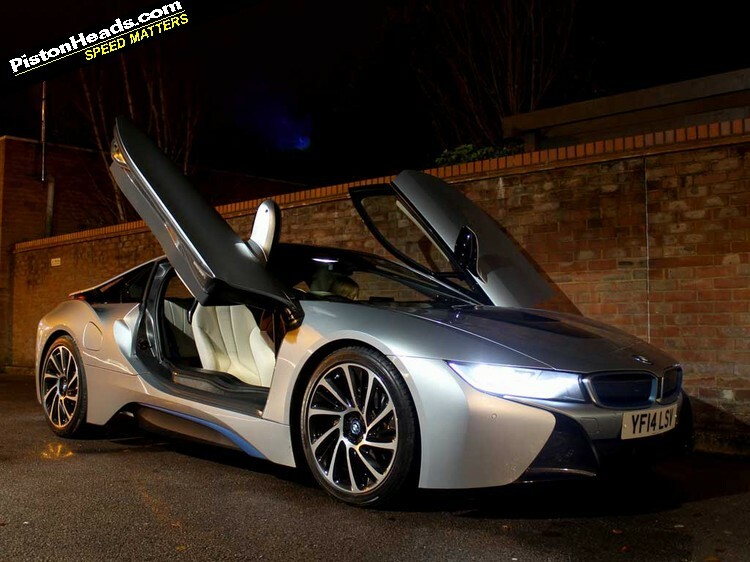 The 'real world' offering in the rarified league of carbon fibre petrol-electric sports cars, the BMW i8 is no P1, LaFerrari or 918 Spyder in performance terms. Not that anyone who sees it seems to care. 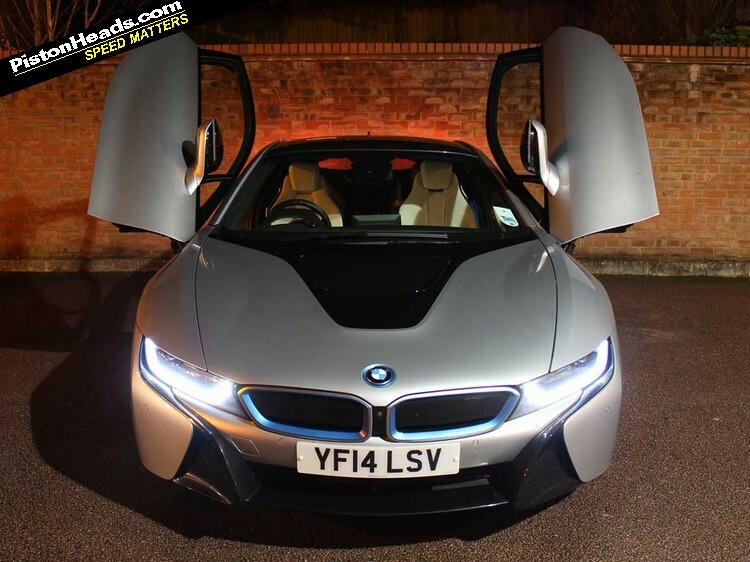 Indeed, while all of the above could slip by innocent bystanders as 'just' normal supercars the i8 has star quality in spades and is so obviously something new and different even non-car folk seem genuinely awe-struck. 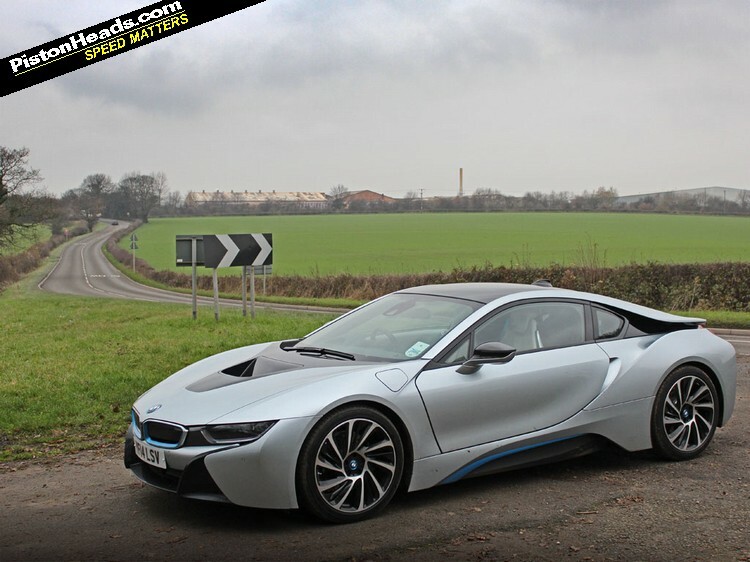 That £99K starting price is interesting too, pitching the i8 directly into the line of sight of the serial 911 buyer who, just might, be looking for something a bit different or eying up electric friendly grants and congestion charging for driving to that City office block. Tempting as the F-Types, R8s, Merc-AMG GTs and similar alternatives at this price might be they all look a little dinosaur-like in the company of the i8, which achieves that rare thing of being incredibly expensive, exotic, unashamedly performance focused and yet totally socially acceptable too. 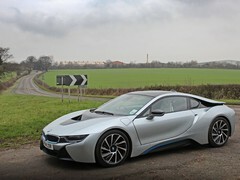 Harris drove the i8 in the sympathetic surroundings of California and Matt had a go up in the wilds of Scotland but for this test we used the i8 in more everyday surroundings, hacking the daily commute and heading up the M1 for a meeting in the way anyone might use a 'normal' sports car like a 911. Electrically plumbed parking spaces at the office meant a chance to charge the battery for maximum EV goodness but the rest of the time it was just a case of jumping in and using it like any other test car. First thought? Getting anywhere near that official 134.5mpg is going to require your very lightest loafers, the best the PH clogs could achieve being less than half that on a mixed commute of stop-start motorway traffic and a bit of urban crawl. OK, so it was winter and we're soft enough to want heated seats on in addition to the rather more compulsory lights, wipers and similar. Still impressive for a 362hp sports car, not so much for a supposed eco champion even driven in a style intended to maximise regenerative charging opportunities and minimise intervention from the 1.5-litre petrol engine. An inbound journey with barely any battery saw 45mpg; the return fully charged had the trip showing 99mpg running on mainly electric for the first five miles of urban driving before dropping to a less impressive mid 50s once on dual carriageways and motorway. Dig deeper into the i8 literature and these are actually more representative of BMW's official expectations. Funnily enough that triple-digit combined figure has rather drowned that out though. 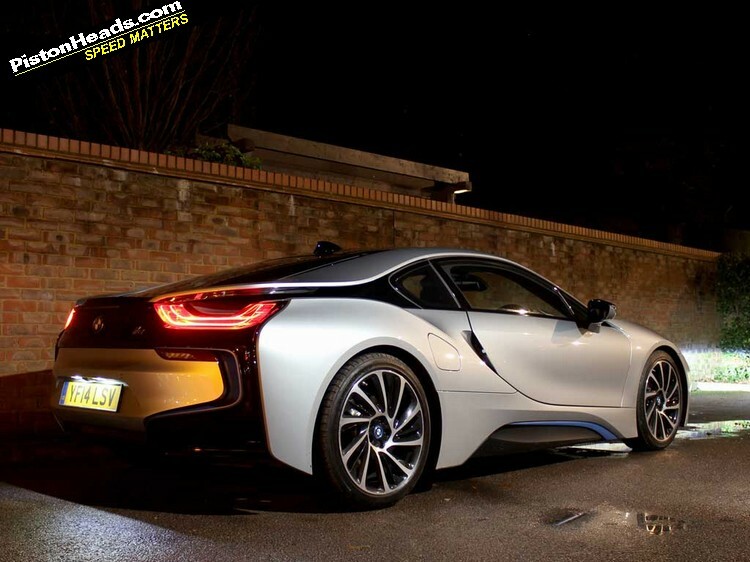 There are tricks to be learned - following a tip from the delivery driver we enjoyed the fact Sport mode that keeps the petrol engine engaged also does an excellent job of charging the battery. 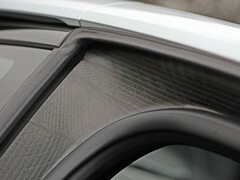 A rather more sophisticated answer can be found by programming your route into the nav, whereupon the computers analyse the profile and calculates where to use petrol power, where to switch to electric and where the best re-gen opportunities may lie. Clever stuff. For sure it is a lovely place to spend time though. The bits you interact with most of the time - nav, phone, entertainment - are all familiar from other BMWs and no worse for that. In all other respects you remain in a permanent level of sheer childlike glee at the sci-fi styling, the way the cool blue lighting contrasts with the white leather, the quality and style of execution and combination of novelty and practicality. Yes, the nursery run was attempted and it's just about possible to run a Maxi-Cosi on the back seat and put a full-sized adult in the one in front of it, accepting a trade-off in legroom. You wouldn't want to do a long run thus but, like a 911, as an emergency family car it just about pulls it off. And leaving the child seat in lets you park in parent and child spaces with a chance of exiting properly, rather than on your hands and knees through a partially opened aperture. What was that about looking cool? Would you be missing that Porsche on those snatched moments on a deserted B-road though? 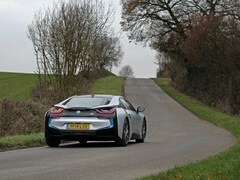 Up to about eight tenths the i8 manages to pull off being a proper sports car pretty convincingly. Sport mode brings the petrol engine into the equation aurally as well as in propulsive terms, even if from inside it doesn't sound entirely convincing. Surprisingly it sounds much better from the outside, the three-cylinder managing to sound far more rorty than its Mini roots would suggest. What it lacks in cylinders or cubic capacity it makes up for in electrically assisted thrust, picking up assertively on the throttle and offering the kind of lag-free response that'll have heads thwacking against seats and already impressed passengers nodding further approval. Integration between the methods of combustion and braking is all very convincing too, both pedals delivering what you might have expected from a 'normal' car of this pace and ability. 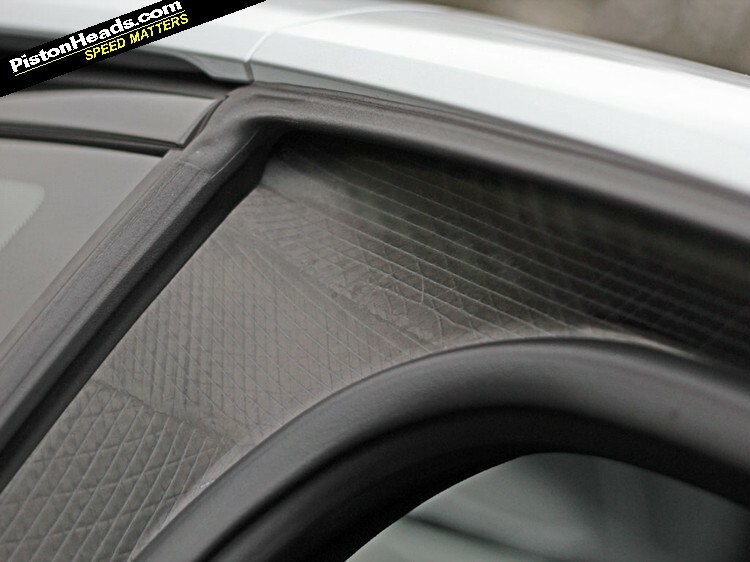 Until, that is, you start approaching the limits that in a properly sorted conventional sports car are so delightful to nudge against. 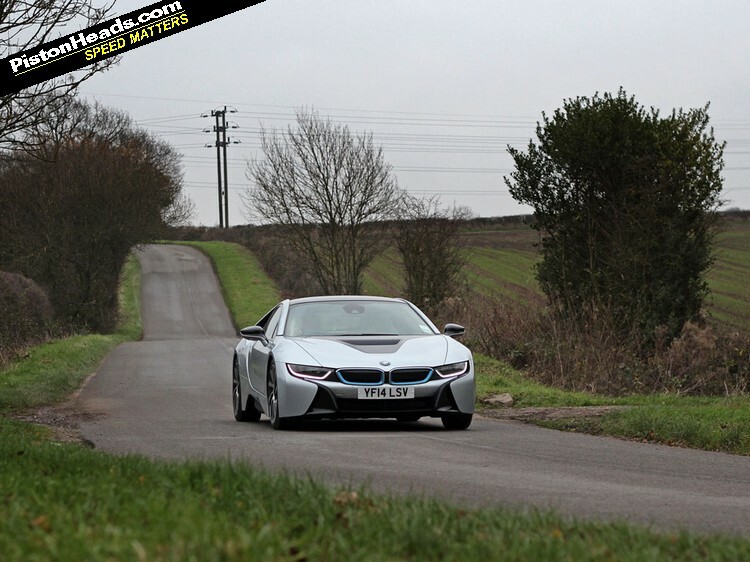 Whether it's weight distribution, geometry, steering or the interaction between all those drivetrain elements is hard to say but there are moments when pressing on that the i8 seems far keener on building speed than shedding it, often at inopportune moments. 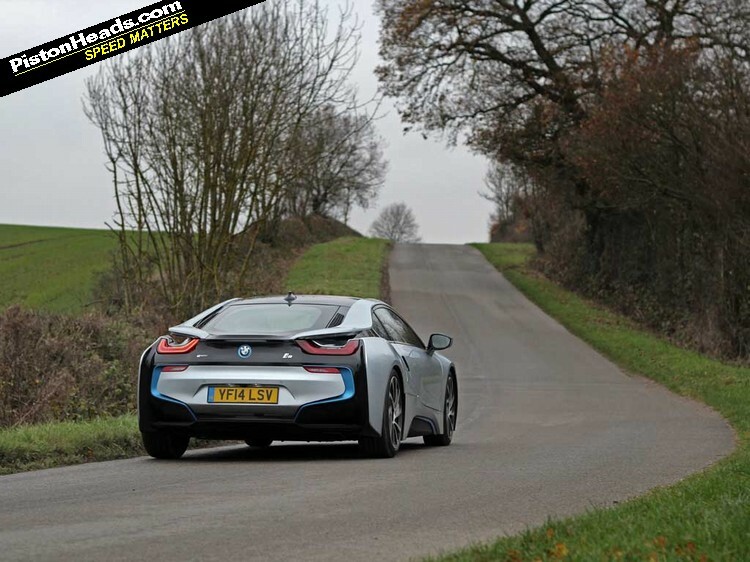 Brake hard into a corner and the vague steering feel, inherent understeer and juggling act of braking and re-gen can sometimes result in a free-wheeling, heart-in-mouth sense things are about to go expensively wrong. And on more aggressive throttle inputs at corner exit you're never quite sure which axle (and, by extension, power source) is going to dictate the cornering attitude. Remember - you've got 231hp of petrol-engined power to the rear wheels via a six-speed transmission and 131hp electric to the fronts with a two-speed, leaving it to the black boxes to decide how much of what goes where and when. No wonder they're not always able to come up with a consistent answer. Does it work out of the city limits? 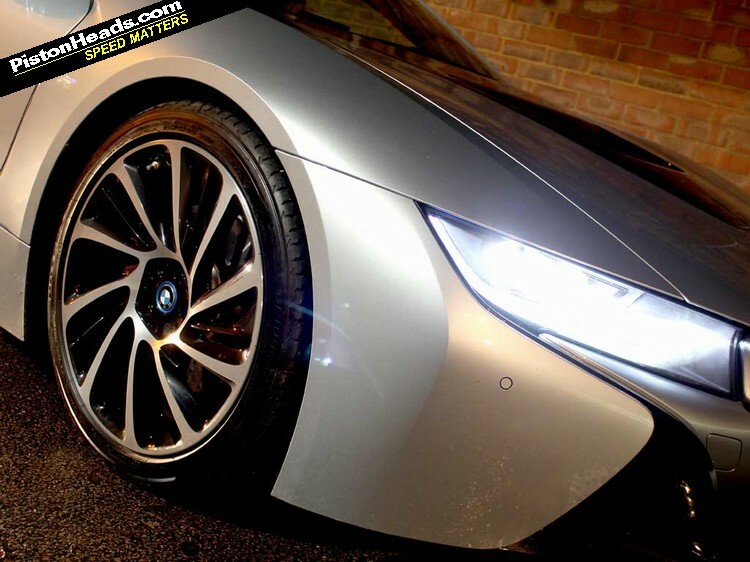 Up to this point the i8 offers a videogame-like sense of invincibility - at times it feels like a virtual reality experience with the road and other traffic projected onto the windscreen. But at the point where things suddenly start to get a bit real it rather runs out of ideas and falls back on the stability control. This, combined with the real-world mpg, starts to raise questions about whether or not this really is The Answer or simply a very complex and expensive stop-gap. 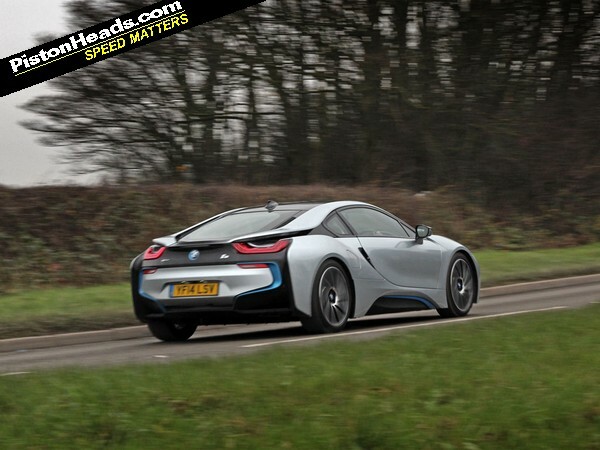 Had the i8, for instance, a Tesla-like all-electric powertrain it'd all of a sudden be a true forward-thinker. Similarly it doesn't quite have the purity of purpose of the VW XL1 and seems a little uncertain of exactly who it's playing to. If you do use that 911 (other sports cars are available) for the daily grind into Canary Wharf an i8 makes a pretty convincing case. If, on the other hand, you save it for those Sunday morning blasts or track days you may end up disappointed. 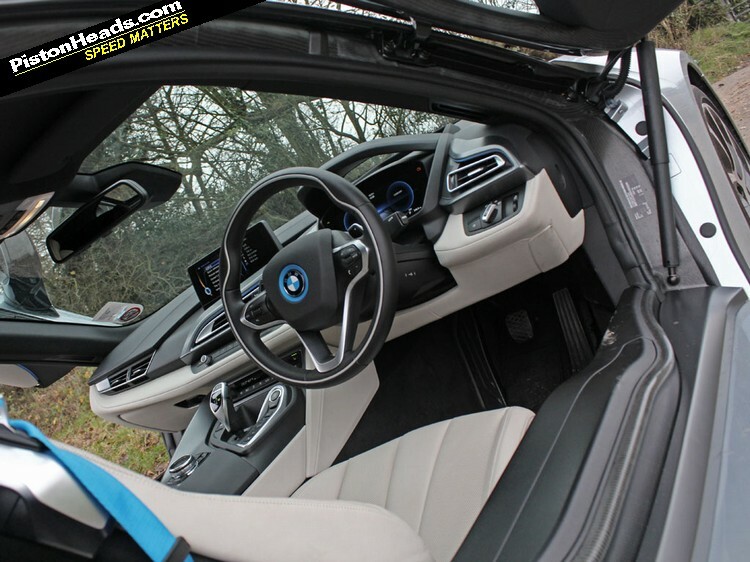 Price: £99,845 (£106,110 as tested including 20-inch BMW i Turbine wheels £1,380, Driving Assistant package £1,490, Anthracite headlining £295, Carpo interior wood £1,150, internet £95, Ionic Silver with BMW i Blue accent £450, Harman/Kardon speakers £895, BMW i Blue seatbelts £310 and universal remote control £200. List price without Government grant). I feel like the 'wow' is wearing off these now. Also, its really not a sportscar, much more a GT. These are a bit Kim Kardashian for me. 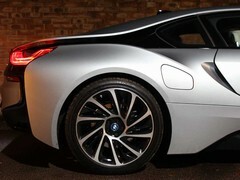 Not bad looking from the front, but a hideous rear end. 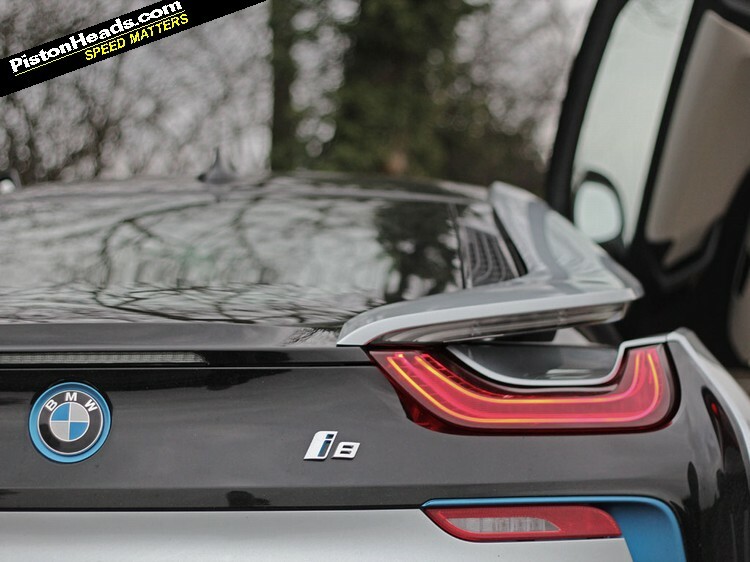 In the real world most of those people buying new 911s (excluding perhaps the GT models) are not the sort of people that are going to drive hard enough to notice the dynamic short comings of the i8 and therefore it seems like a pretty good alternative. 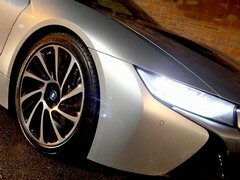 Personally I would like to slap the person on here the first wrote that the i8 'look like it is giving birth to a 911". 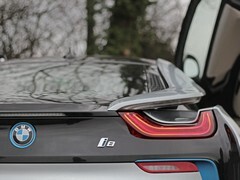 I couldn't immediately see what they were saying...but now that I have I can't "unsee" it and the i8 looks really odd at the rear because of that! 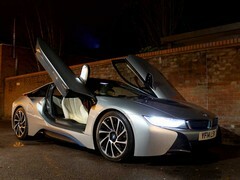 I love my i3 (pure EV) - it is a perfect solution to my (admittedly short-range) transport needs. 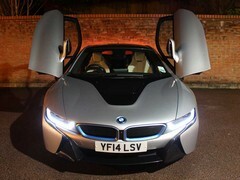 However, much as I respect the engineering involved in the i8, my £100k (I wish!) would go towards a 991 C2S or Tesla P85D instead. 231bhp from the 1.5 3 cylinder! Highly stressed much?